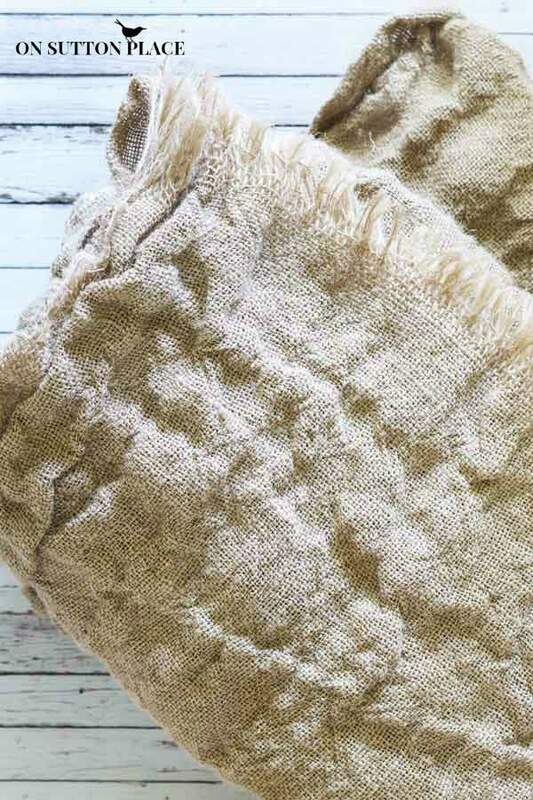 How to Wash, Dry and Cut Burlap. plus tips for a straight cut. This is one of those posts that I have wanted to write for soooo long. I have several burlap projects on my blog, yet I never showed you how to wash, dry and cut burlap so it’s easier to work with. I’ve got this down to a science so let’s talk burlap! I admit that I was late to the burlap party but when I finally arrived, I realized how fun it was. Burlap has many good qualities, along with some bad ones. Thankfully I think the good outweighs the bad. 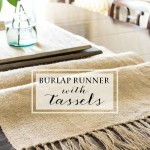 The very best thing about burlap is that it’s budget friendly. At 40 to 50 inches wide, most of the time you can find it for $2 – $3 per yard. It’s neutral in color and goes with many different decor styles. Burlap has come a long way in the last few years. It’s now available in different colors and prints. I fell in love with the print above with the birds and the branches. This pic is what my burlap looked like right off the bolt. Very stiff and very smelly. Let me show you what to do to fix that! I usually buy burlap in lengths of 3 to 5 yards. Click HERE for a great source. I wash each length in my washing machine with the regular amount of detergent. It has never harmed or clogged up my washer in any way. I also add fabric softener to the rinse cycle and lower the spin cycle to medium. I try to catch it as soon as it’s finished so no wrinkles set in. I dry it on a normal dryer cycle but make sure your lint catcher is completely clean before you dry any burlap. The lint and fuzz from the burlap will fill it up. After it comes out of the dryer, I head outside and shake the daylights out of it. More fuzz comes out and the good thing is it’s outside and not in your house. Here is what burlap looks like after being washed and dried. The ends will be a mess and it will be wrinkled. The next step is to iron it. I use my regular iron on the hottest steam setting. I spritz it with water a section at a time and then just start ironing. This 3-yard piece took me about 15 minutes. It won’t be completely smooth but it will lay pretty flat and be much easier to cut. 1. 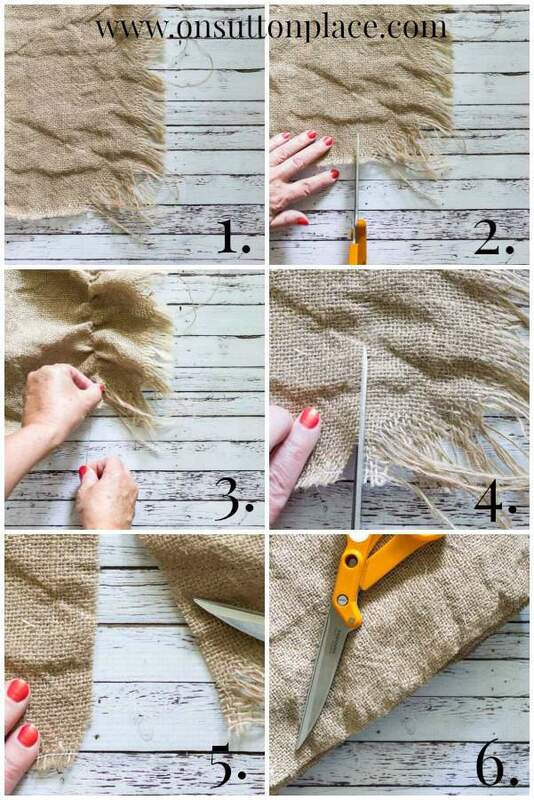 Lay your burlap on a hard surface so the end is running up and down in front of you. 2. Find where you want the cut line to be and make a small snip in the burlap. 3. Pull a thread from where you made your snip. Just keep tugging at it and the burlap will start to gather. Gently pull the thread until it comes completely out of the burlap. If it breaks don’t worry. Just find where it broke off and start pulling from there. 4. You will see a sort of channel where the thread used to be. 5. Carefully cut along this channel from one side to the other. 6. You now have a perfectly straight end to your burlap. I washed a small piece of the bird burlap to see if the pattern would fade and it did a little. I decided to go ahead and wash the whole piece and I love the way it turned out. It’s faded and looks very vintage. 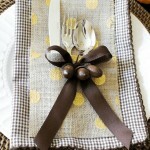 I plan to make table runners from it and will be back to show you the how-to very soon. Super easy I promise. Note: the bird burlap is no longer available. 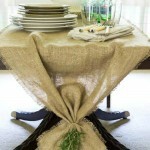 I used to be a burlap skeptic but after working with it I am completely won over. If you are skeptical, just give it a try. You might surprise yourself and end up liking it too! 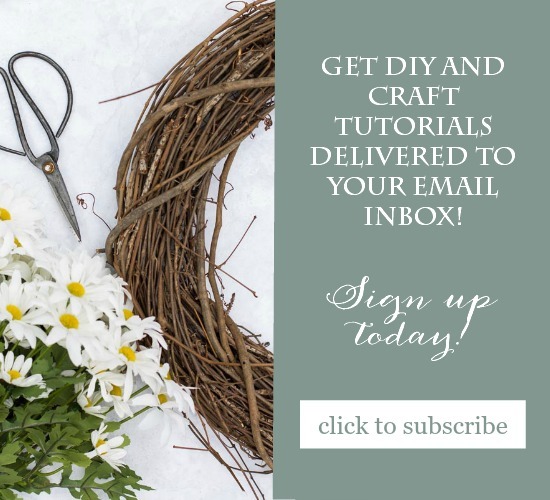 Click these handy links for more burlap inspiration! Are you a member of the OSP family? We’d love to have you join us! I just bought burlap curtain panels and they are very stiff. Do you recommend washing and drying them to soften them? Will the fabric shrink? Cold water? Hi Chris! I would be very careful with curtains. Burlap does shrink and I would hate for your curtains to be too short if you wash them. Are there laundering directions? If yes, I would definitely follow them. If you purchased them online, there may be reviews that have some information from customers about laundering. I hope this helps…good luck! I have a question. You mention in your washing instructions that you wash each length. Do you wash each one individually? Knowing how burlap frays I’m wondering if washing Pieces together makes them tangle? Just want to be sure before I tackle my stack. 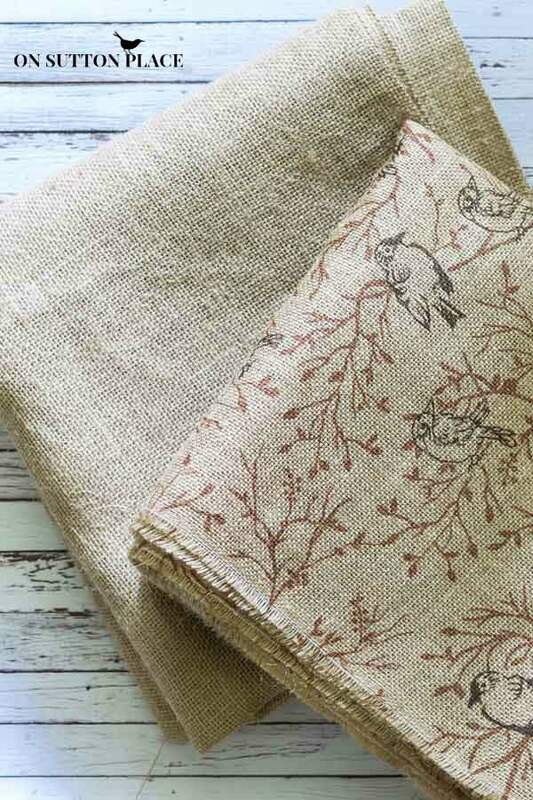 The birds are gorgeous….I bought 4 yards last time JoAnn’s had a 50% off sale. Thanks for answering. Just got into reading your burlap tutorial. Thanks. I was also wondering if you use washed burlap for making your bows? I love the bow on your fall wreath with the pumpkins. I tied a burlap bow around one of my jars (not from a bolt, but from a spool of coral burlap) and it looks a little bulky. Any suggestions? Also….loved Jeffery’s Antiques…stopped in while in Ohio! Hi Janet! 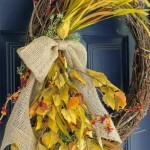 The bow on the fall wreath was made with 4 in. wide burlap ribbon that I got at Hobby Lobby. It’s not real stiff and almost looks like regular burlap. When you actually tie a bow there is a lot of bulk. The bow on that wreath was made a bit differently. Here’s the tutorial: https://www.onsuttonplace.com/2012/11/how-to-make-a-perfect-bow/ Jeffrey’s is wonderful isn’t it? Thanks for stopping by! Wonderful tutorial, Ann! Can I admit right here that I hate burlap? It’s very scratchy and sheds everywhere. I’ll do as you say and wash it in the future. In my experience with burlap, pulling the thread and cutting on grain has caused my end to be a straight cut but not 90 degree angles at the corners – as in, it looks bias. Maybe it’s just my luck to get poor quality burlap, but is there any way to make it look straight without cutting off grain? I always love visiting your blog. Everything you do is neat as a pin and beautiful. You inspire me so! Hi, and thank you for this! I guess I’m reeeaally late to the party! It seems to me that nobody’s “over” these things yet. If anything, we hold them even dearer to us the more we use them in our own lives. I mean, all these relics that we find new uses for are seriously magical! They allow us to connect with history in a tangible, very real way. It makes us think about the people who used them before us and wonder about their lives. I think about how much simpler life seemed to be in those times. Our lives seem so hectic and complicated, even though we supposedly have many more conveniences now. (Doesn’t quite add up, does it?) When I think about those people…I think, “Wow…what an amazing generation of human beings.” And whether they were family or not, or even if I knew them or not in life, I always imagine them smiling down on me for caring about their beloved things; It feels as though I am honoring them, which makes me feel joyful at heart. It’s a win-win, totally. Ann, the first time I washed and dried burlap, I panicked when I took it out of the dryer! :) Probably because I was in the middle of a project and the closest fabric store is about 15 miles from where we live! So glad to know that you can wash the printed fabric, too and I can’t wait to see your table runners! Double-folding and hemming the raw edges before washing will eliminate the fraying and greatly reduce the amount of lint. 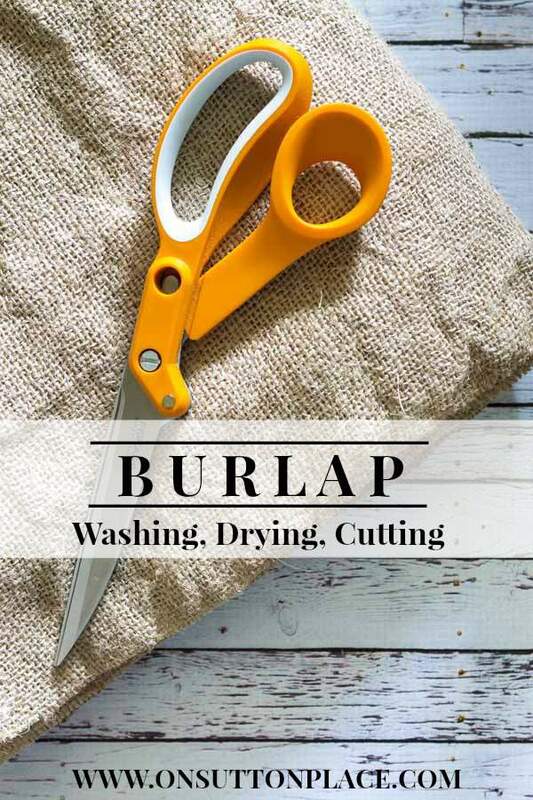 Thanks so much for the info about how to wash, etc burlap……. Such a timely post for me! Thank you for all your amazing ideas! I love burlap and I had read about pulling the string out before cutting, but I never thought about washing and drying before working with it. but it does make since. I will give it a try. Thanks for the tip. Hi Ann! I haven’t been with you long, but I love, love, love your blog! Thanks so much! 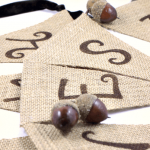 I have a question about burlap….I’ve been told it emits formaldehyde and can be harmful to inhale. Is that true? And does washing remove the formaldehyde? 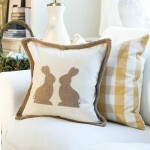 I have purchased untreated burlap from OnlineFabrics.com, it’s actually upholstering fabric. I used it to make a fitted table cover for a 2′ x 4′ table that I use on a lemonade stand. I thought it might be better because of the formaldehyde issue, but it turns out that it stains terribly! Ugh! I should have treated it with waterproof spray or something before using it with liquids or food. But the lemonade stand is really cute, I’ll send you a pic if you would like to see it. I don’t know about the formaldehyde issue so I can’t answer that. I do know that burlap has a terrible smell off the bolt. After washing with fabric softener, drying and shaking it has hardly any smell at all. My guess would be that washing takes care of the formaldehyde issue but I am not totally sure of course. I’d love to see your lemonade stand too! What a awesome article Ann. I love the bird burlap .I also want to know if it takes the smell out. Seems like a lot of work to me.I used some in my basement to cover a shelf that has paint cans & etc. I just folded it over a tension rod and took some clothes pins to hold it in place. it not perfect but it serves the purpose ( cover up the paint cans ) The bird fabric would have been sweet !!! I usually hang it out for a little while straight out of the washer, let it dry some then iron it while still slightly damp, for me it helps it not to be quite so wrinkled. I also do this with linen. I still have yet to really like working with it but I do know some projects just look better in burlap. Yes I know some other crafters who air dry their burlap too. Another great option! Thanks for this, Ann. 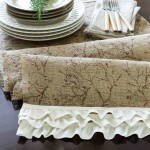 I have wondered about the printed burlap, and bought some when I was last down in WA and visited a Jo-Anne fabric store. All my burlap is in storage, but now that the house has sold I can get it all back home and have some fun! I am so happy you sold your house. What a weight lifted off your shoulders. Hope you and The Great Dane are at peace in your new home…where ever that is! Good simple and easy to follow advice Ann. I worked for many years for JoAnn Fabrics back in the 1990’s and this is how we were taught to cut burlap. A lot of customers didn’t understand it and we had to have a mini burlap cutting classes while we were taking care of the customer. Actually Diann when I was buying this burlap there were several gals gathered around the cutting table. None of them knew it could be washed so I gave a mini tutorial right there on the spot. They were all very amazed! Great tutorial Ann! I love that printed burlap. Thanks, Ann, for these helpful instructions. Everything I’ve ever read said NOT to dry burlap in the dryer, but now that I know it won’t shrink to a one inch square or blow the dryer up (ha! ), I’m doing it! It would certainly help with the lint aspect tremendously! Thanks again for sharing! This is fabulous Ann. I never even tried to wash burlap because I didn’t know how and was afraid I would ruin it. Thanks for the great tips! Thanks for the tips, Ann. I have not gotten on the burlap bandwagon because of the texture and smell. 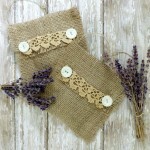 Ann, I love working with burlap, too! I usually make banners like your reversible one. 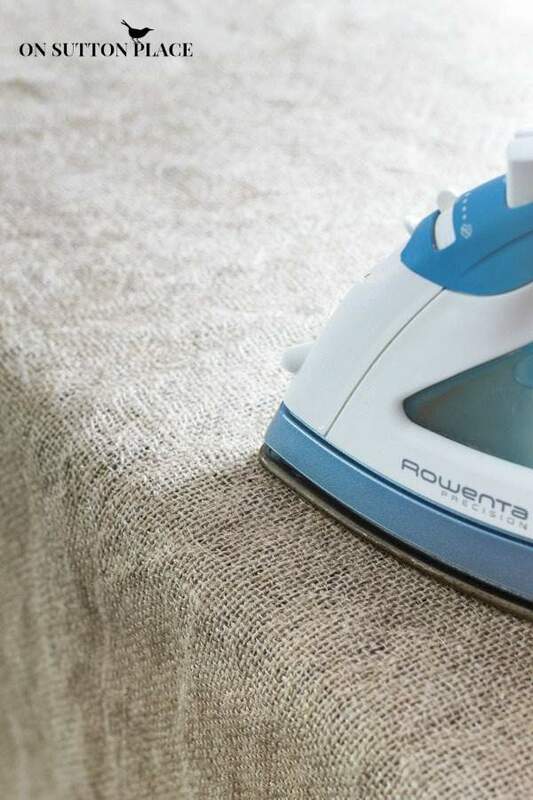 Do you wash burlap when you want it to be more like fabric? And does it remove the odor? Great tips Ann, it’s amazing how much lint comes off that fabric. I always try to work with it outside for just that reason. Pinning!